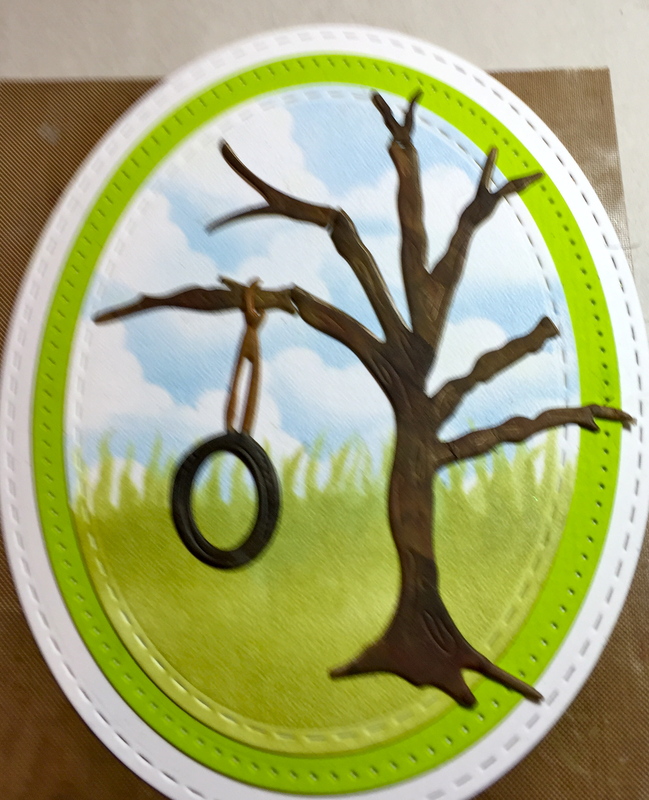 I die cut Els van de Burgt Studio Stitched Oval–the largest and third largest in Soft Finish/White 100 lb card stock, 4 times; the second largest in Premium Palette card stock, one in each color. Spring–Spring Green, Summer–Grass Green, Autumn–Orange, Winter–Turquoise. 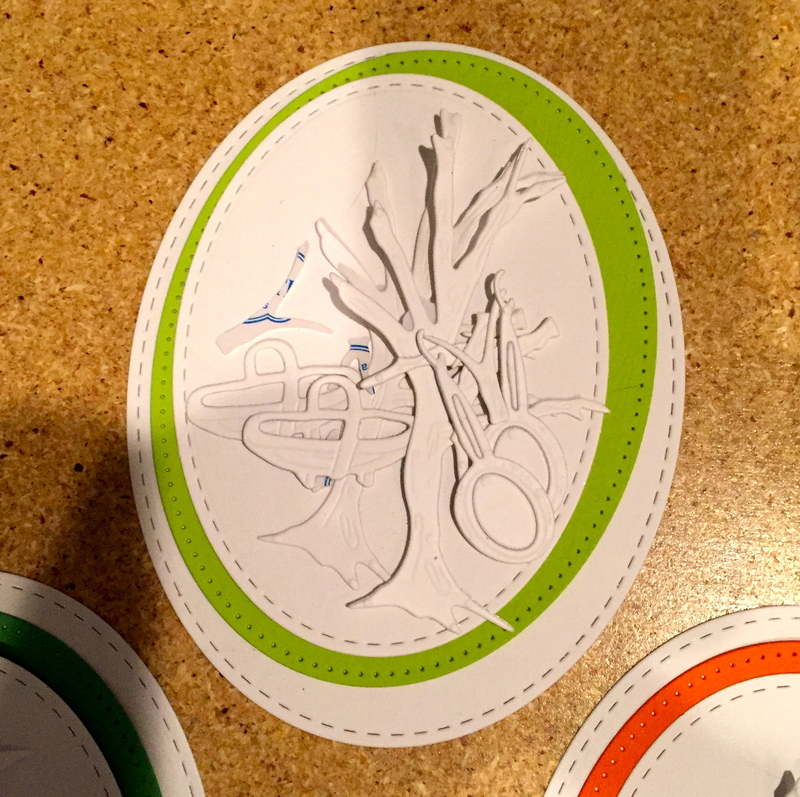 I also die cut Backyard 3/Apple Tree, twice (for a total of 8 times) in the Soft Finish White 85 lb. 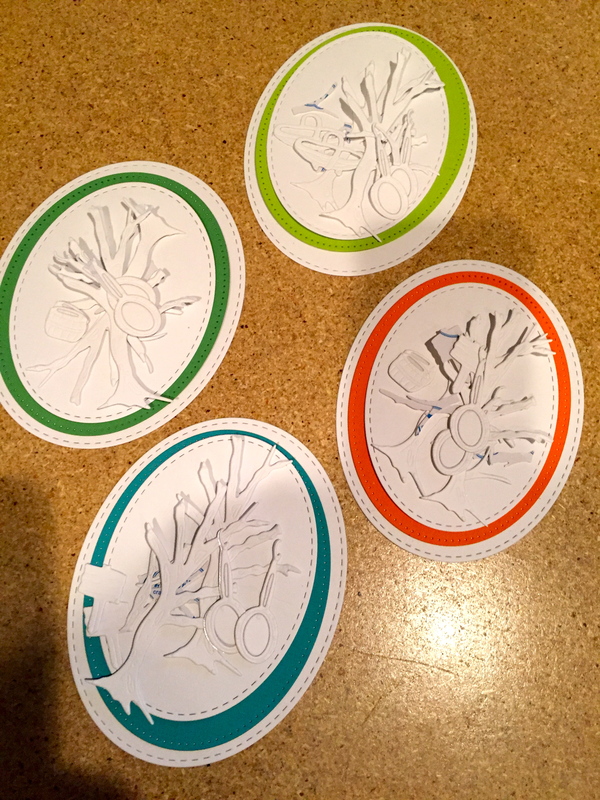 card stock with Clear Double sided Adhesive on the back. I like to build up my pieces to project some dimension! 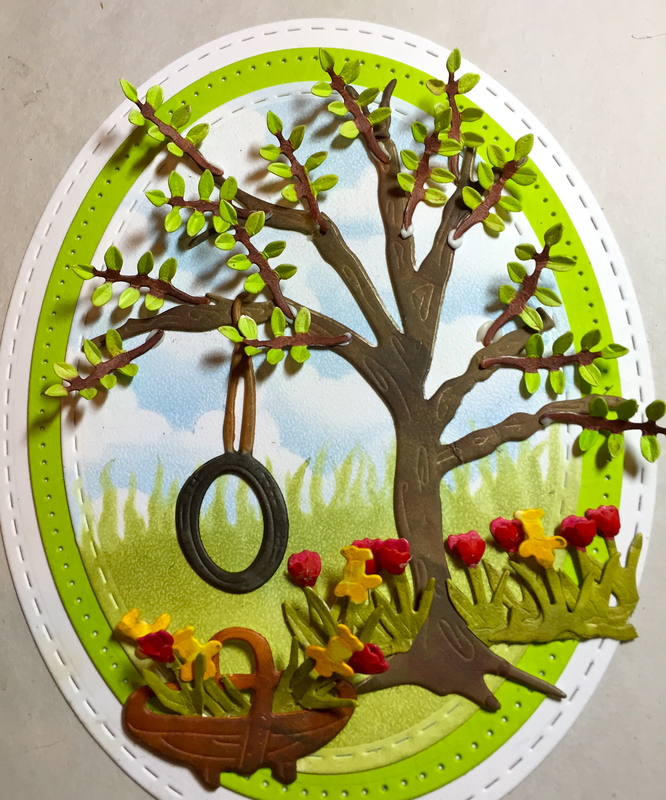 For Spring, I also die cut CountryScapes Garden Edges/Tulip and Daffodils, Flora 5 Trug basket, Critters 1 Squirrel and Cardinal in the same card stock. Assemble the Stitched Ovals. 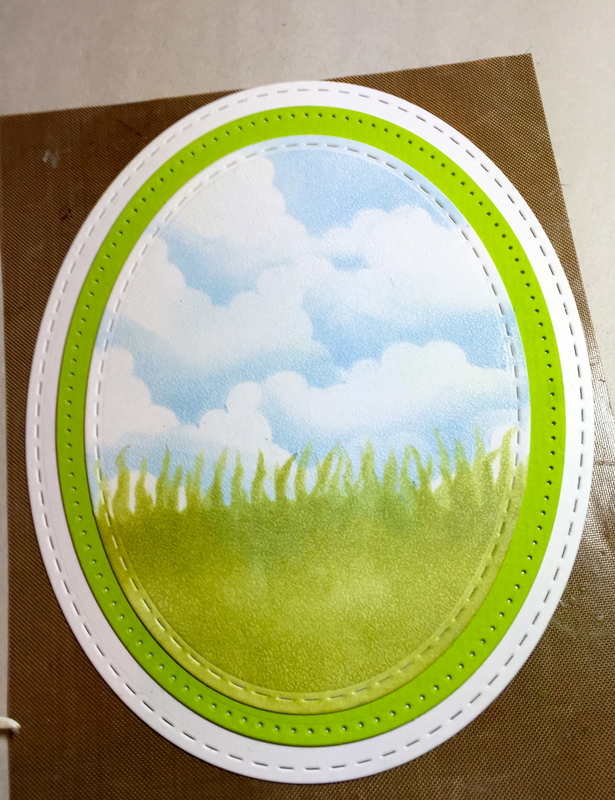 Using PanPastels Set 2 (Phathalo Blue Tint for clouds & Bright Yellow Green Shade for grass)and a template created from the Cloud & Grass die, shade the third oval. Coloring the Tree. I first used PanPastels Set 3 (Raw Umber) to shade the pieces, then I went over some areas with a sponge applicator with Distress Ink/Walnut Stain and Frayed Burlap. Place tree in the oval. 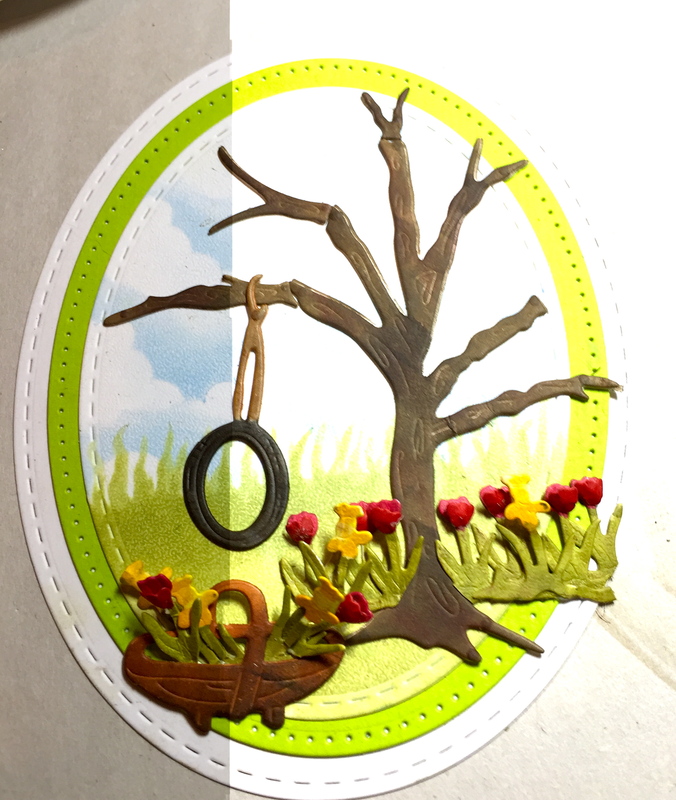 Color tire swing with Copic Markers–E15 for the rope and C7 and E89 for the tire; set in place. Color the Garden Edge Tulips and Daffodils with Copic Markers–R46, Y19, and YG95. I trimmed the flowers to fit into my picture. 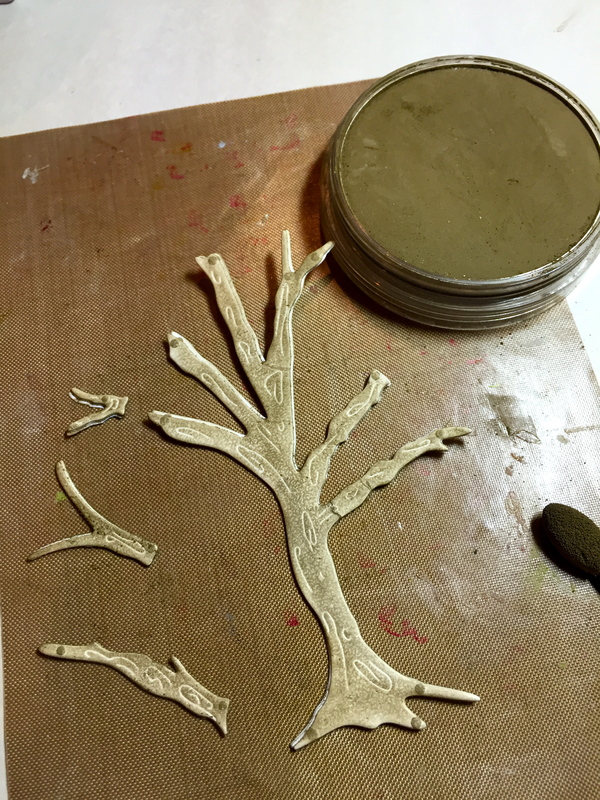 Die cut about 15-16 branches in Soft Finish White 85 lb. card stock. 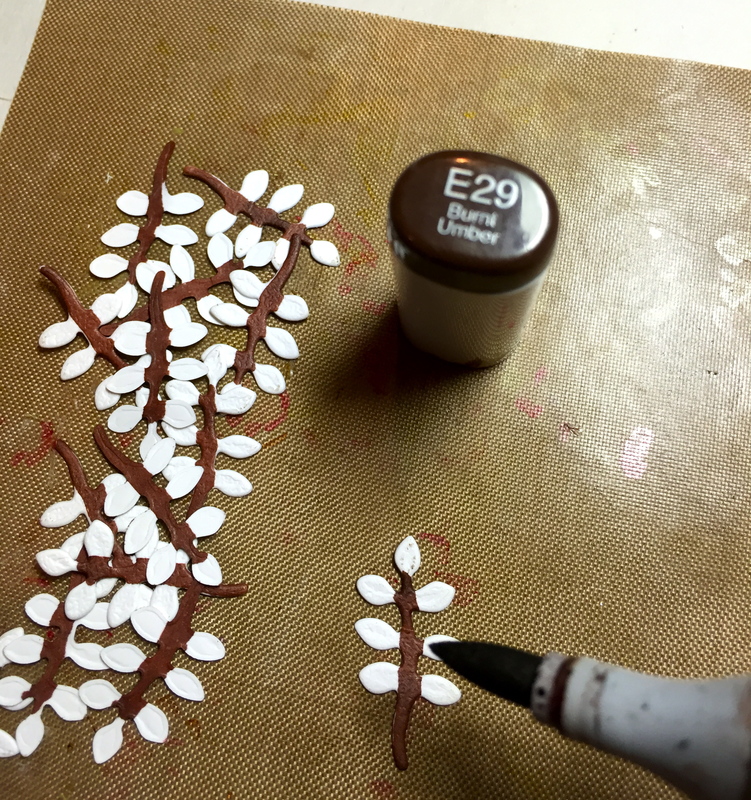 Color the branch with Copic E29 and the leaves with YG63. 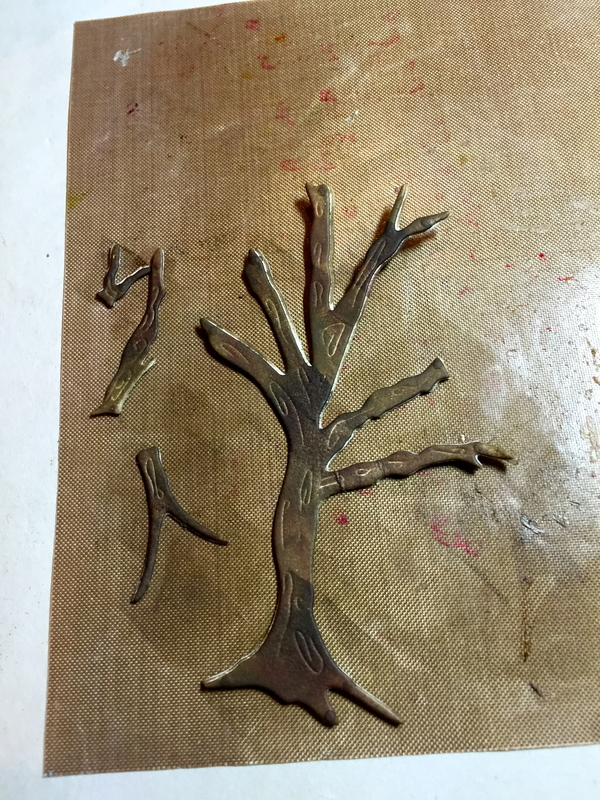 Place the branches on the Leaf Pad and use the Leaf Tool to add stem lines down the center of each leaf. (Yes, I know it’s tedious, but it’s the detail that counts.) Add these branches to the limbs. 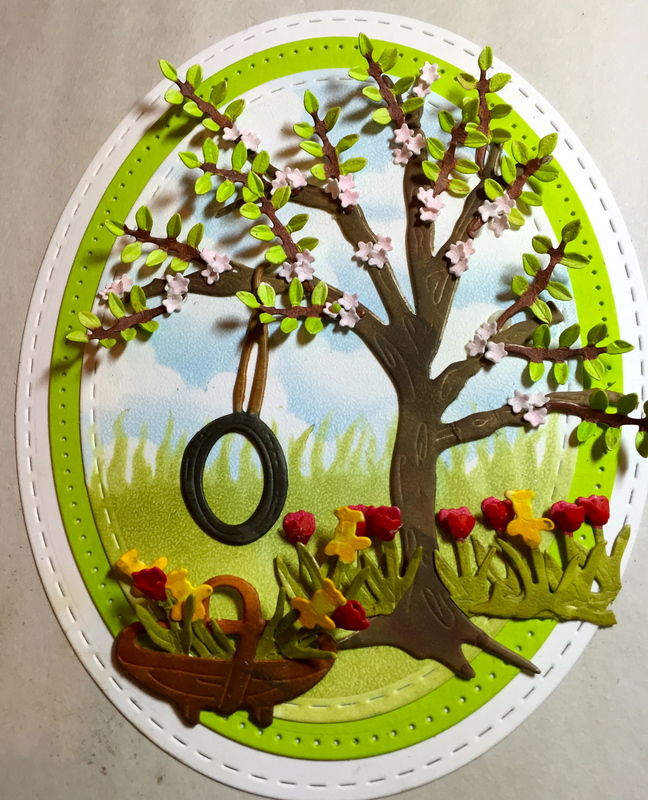 Because this is Spring, I need to create apple blossoms, so I used the little flowers from the Mini Botanticals/Azalea in clusters of three. I lightly shaded Soft Finish 85 lb. White card stock with PanPastel Set 1 Permanent Red Tint (light pink) before die cutting the blossoms. 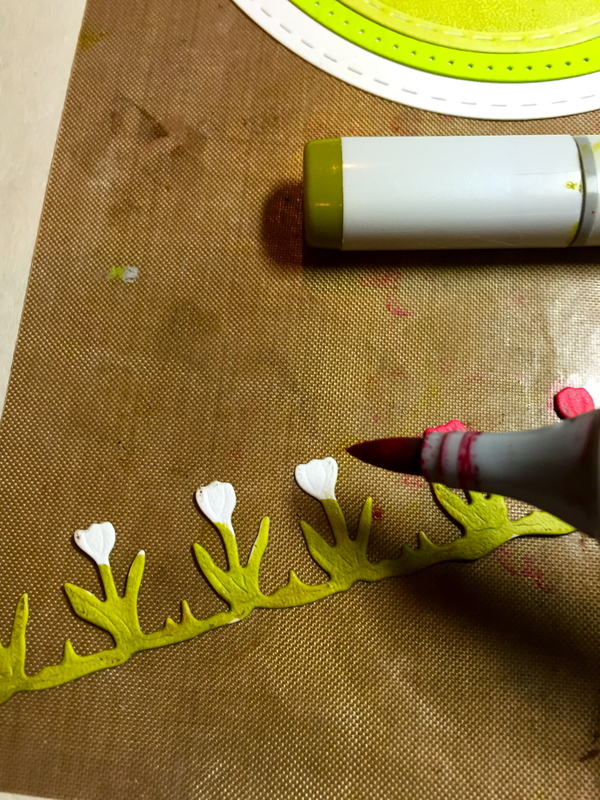 Place on the Molding Mat and use the small ball stylus to cup the flowers. 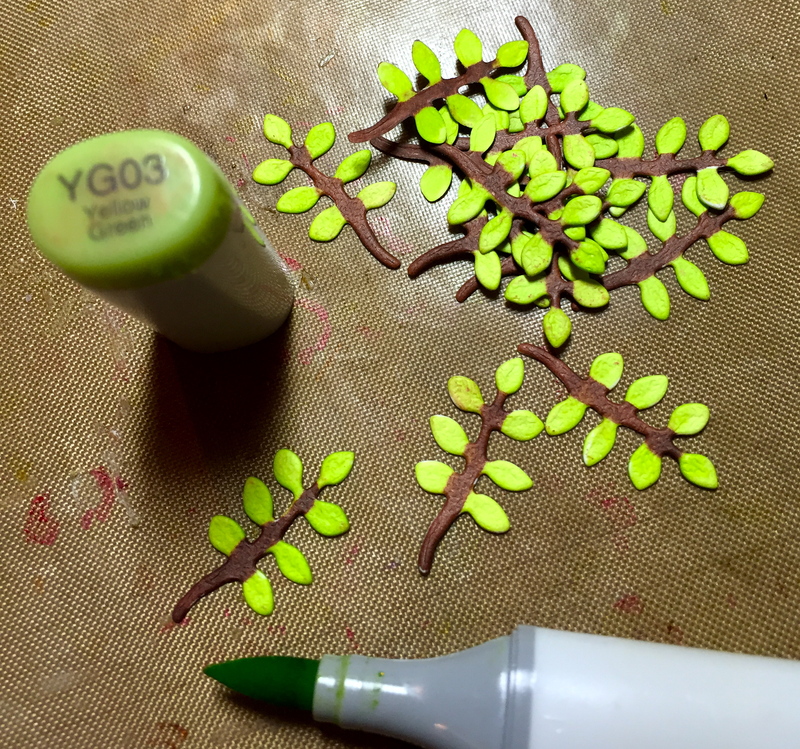 Pick up the individual flowers and lightly dip into Beacon’s Kids Choice glue and adhere to the branches. 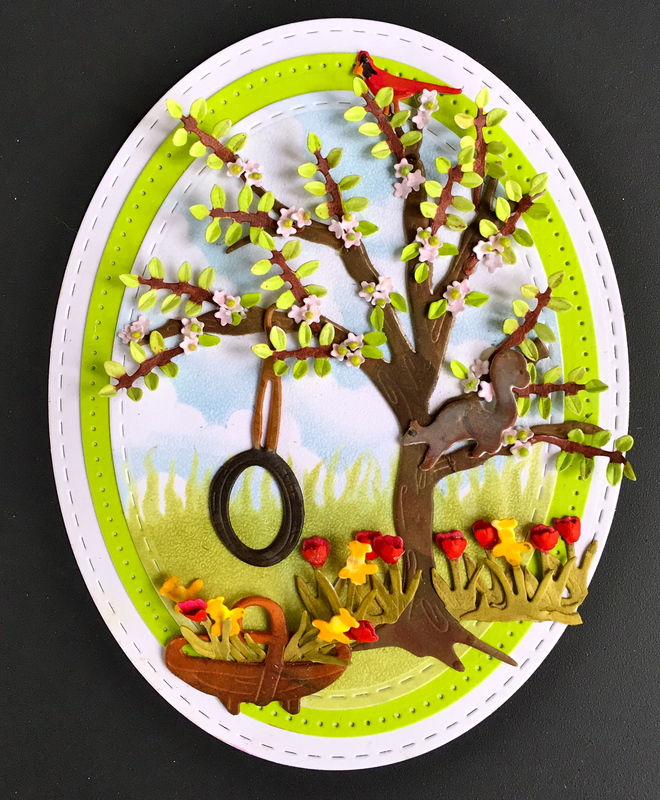 Finally, I added a few individual leaves around some of the clusters and colored a Squirrel and Cardinal to complete the scene. I love Spring the best. Great job. My 2nd favorite time of year! Fresh cool air and the earth coming alive….glorious! I love the tulips in this card. My father in law loves tulips! When I went to visit him last year, I got the chance to see his garden. I felt so happy just because of the vibrant and happy colors around me. I think it is incredible that your cards remind me such good memories. Thank you!